Although Green Sandpiper is an annually recorded passage wader at Wanstead, usually seen along the river Roding or as a flyover on the Flats - I've struggled to catch up with one, which is not that unusual as waders in general seem to elude me at Wanstead. My only previous record was a bird in flight calling over the Flats, which I failed to see and frustratingly went down as heard only. So with news of a bird enjoying the exposed mud of an ever shrinking Shoulder of Mutton lake (possibly for its 3rd day). A - I was keen to see it, and B - Seeing any feeding wader on the deck in Wanstead is always a bit of a novelty for us landlocked locals. 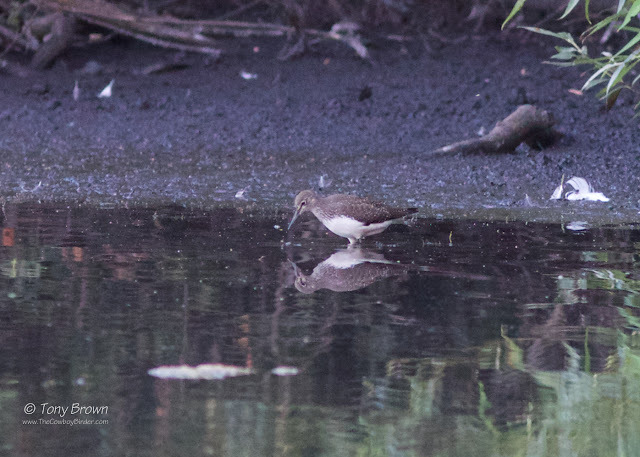 Adding Green Sandpiper to the patch year list brings me up and into the nervous 90's, and with Nick Croft hearing Little Owl on the Flats as he made his way home after connecting with the Green Sandpiper, hopefully 91 is not too far away.